You will find this out quickly. Watching regatta’s can be confusing. Regatta’s are notorious for lots of waiting, fast racing, and more waiting. If you arent ready, or dont know what you are looking for, you might miss it! Just to be clear. 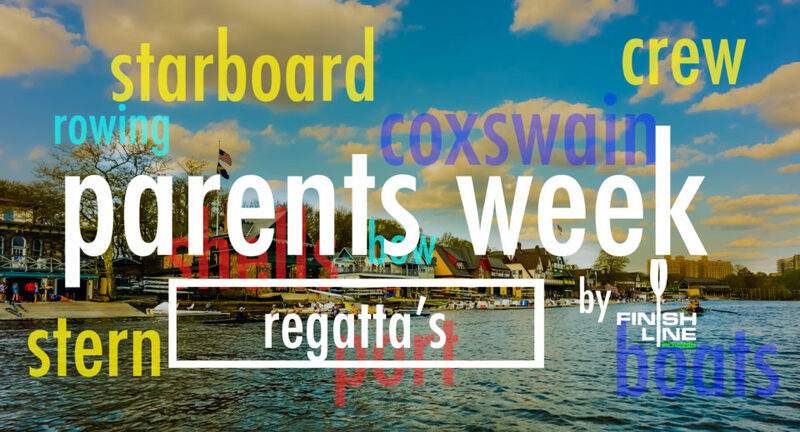 this is a parents guide to regattas. not a coach’s guide, or an athlete’s guide. 1. First things first. Regatta Prep. There are a few things that we recommend doing before attending, and subsequently bringing to regattas. Check the weather. Sounds simple enough, but you would be amazed how many regattas we have been to and seen parents either freezing, soaking wet, or sunburned and sweaty. Just check the weather. Weather at regattas in the fall and spring can be weird. Overpacking for a regatta is not a bad idea. We have been to regattas in the fall that start out at 40degrees, and end at 85degrees. We also have been the regattas that start out at a wonderful 65 and sunny and ended in a snow squall [no, we’re not joking]. Footwear. Regatta’s are watched on the banks of rivers. Even on the best days the banks of rivers can be a mess. If it is raining, might rain, or rained yesterday, boots are not overrated. If its hot and sunny, it will be dusty. Don’t wear your nicest shoes. Check out the venue. Each venue can be very different. Most venues dont actually have seating, so if you want to sit, you better bring a camp chair. Because of the way rowing is set up, if you plan to stay in one place, you might be limited on view. If you want to see more, make sure you bring a bike! Regatta backpack. Trust us. Its just easier. something to read – this is a Pro Tip from a mom who had 3 kids row. Pack a towel. I don’t know why, they just always come in handy. Parking is unpredictable. Most regatta venues are not prepared to host the HUGE number of cars that show up. We ALWAYS recommend checking out the race website to know where to park. Philly and DC especially! Walk around and see the boats. Its fun to be able to get up close and personal with the boats. Most sporting events don’t afford the opportunity to get up close and personal with the equipment. PLEASE, PLEASE don’t touch without asking the coaches first. These are precision boats and coaches spend a lot of time dialing in the boats. One more tip for parents on behalf of all the coaches out there. Please let the coaches have your athletes undivided attention for ~30 minute before they launch [get on the water] and for ~15 minutes after they come off the water. Keeping the attention of high school kids is harder than keeping the attention of toddlers. 3. Watching rowing: US Rowing put these tips together and its hard to say it better than they did, so they get all the credit for this next section. The crew that’s making it look easy is most likely the one doing the best job. While you’re watching, look for continuous, fluid motion of the rowers. The rowing motion shouldn’t have a discernible end or beginning.